Break up the leaves from 2 Little Gem lettuces and 1 Romaine heart lettuce and wash and drain well. Place the leaves in a large serving bowl and add a 50g can Waitrose Anchovy Fillets in Olive Oil, drained. 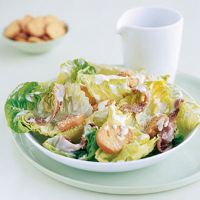 Grate in 25g Parmigiano Reggiano, then pour over 4 tbsp Waitrose Fresh Caesar Dressing. Add 50g Waitrose Garlic Croutons and toss together well.